Ironically, where you go to become clean is often one of the dirtiest areas of the home. The warm and wet climate in a shower makes it a haven for soap scum, mildew and oily buildups. Get your shower clean with the best products on the market for your situation, and maintain a clean bathroom. Get clean in a clean shower. If you're good at cleaning your shower every day, you can use a spray cleaning product made for the bathroom shower. Simply spray it on, and let it sit for the recommended amount of time. Wipe it with a rag or sponge and rinse. Rinsing is important because you can damage shower tiles if you don't do a good job rinsing. According to Consumer Reports, Kaboom Shower Tub & Tile trigger-spray cleaner was the best daily cleaning product to prevent soap scum and mildew from even forming. In a week's time, soap scum, body oils, shaving cream and other things can begin to build up. The best product to use weekly is a scratch-free powdered cleaner. According to Consumer Reports, Ajax with Bleach Scratch Free and Comet Scratch Free Disinfectant with Bleach are excellent at cleaning the shower and also don't leave streaks. Always read, apply and use the product as described on the label. You will have to do a bit of scrubbing. Remember to rinse well. White vinegar is one the best products to use if you have hard water buildup. The discoloration around the drain, spigots, shower door and shower head are often where hard water is most noticeable. 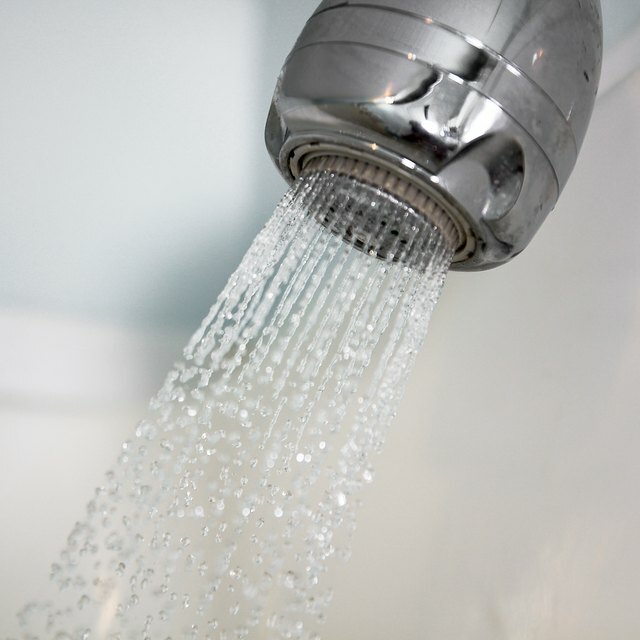 Your shower head may also lose some of its power if hard water has started to build up in the holes. Spray the areas with white vinegar, and allow it to sit for about 15 minutes before wiping clean. For a clogged shower head, remove it and soak it in pure vinegar for about 30 minutes and rinse. Chlorine bleach is the best product to use to kill mildew, a living organism that can get out of control in a damp, warm bathroom. According to North Carolina Cooperative Extension Service, using 1 cup of bleach for every gallon of water is usually enough to remove mildew. Other products also work, such as white vinegar and ammonia; however, never mix ammonia and bleach since together they create a toxic, deadly fume. Keep the room well ventilated when working with bleach and other cleaning products as instructed on the label.